Buy UTG 3x magnifier with flip to side mount for red dot sights, optics and scope on sale. Find great deals on Sightmark 3x 5X 7X tactical magnifier with flip to side mount for weapon sights used in military and law enforcement applications for sale. 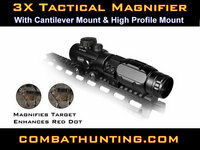 A tactical magnifier for weapon sights, red dot and Holographic sights improved accuracy in medium range to long range and increases target recognition identification. A Tactical Magnifier Gives You Rapid Transition From Close Quarters Battle To Medium Range Sniping.